Mark Pritchard, who writes with his spiritual name Belsebuub, is a British-born author and spiritual practitioner. He is best known for his influential works on the subjects of self-knowledge and out-of-body experiences, but has also written widely on dreams, personal transformation and the journey to enlightenment. Over the last twenty-five years, Belsebuub has explored these subjects in-depth in his own life. He has also explained them to hundreds of thousands of people through course systems and websites he established for this purpose. Beginning in the early 2000s, Belsebuub pioneered a free online course system to share spiritual knowledge. His courses were also presented in person at study centers in many major cities around the world. These courses were attended by a total of over 90,000 people from over 100 countries. Belsebuub also wrote countless articles and books on spiritual subjects, of which one became a best-seller. Self-knowledge and understanding oneself for the purpose of spiritual growth have always been at the heart of Belsebuub’s work. He describes this as a process of spiritual transformation that ultimately leads a person to reunite with the divine source of creation. This process is at the heart of many ancient spiritual traditions and teachings, and is often referred to as spiritual awakening or reaching enlightenment. The consciousness, Belsebuub explains throughout his works, is the source of inner peace, wisdom, psychic faculties and mystical experiences. He explains that by studying ourselves, understanding and overcoming negative inner states such as anger, fear, greed, negativity, and so on, we can bring about profound changes in our lives. Beginning in his childhood and carrying through to his early adult years Mark (Belsebuub) held a deep interest in spiritual subjects. He attended various groups, visiting sacred sites, and frequenting lectures by Jiddu Krishnamurti where he first learned about practices to experience the present moment. Mark was deeply inspired by these practices, however, despite having a profound respect for Krishnamurti, he found his teachings to be circular and therefore unable to lead to profound inner change. In the early 1990s Mark came across another spiritual school explaining how a person could follow the process that leads to enlightenment in a practical sense. Through this school he began exploring exercises for awareness and self-knowledge more deeply which led him to begin an inward journey to enlightenment, a process in which he has now reached the latter stages. learned about the true purpose of life. ~ Training in Spiritual Exercises, Belsebuub Biography site. 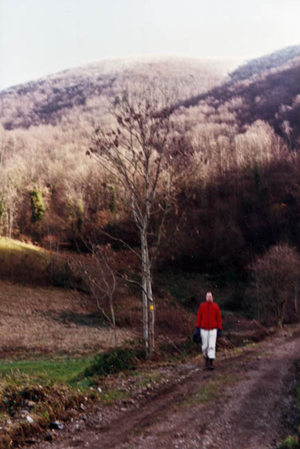 Mark (Belsebuub) sought quiet time in nature to explore consciousness and the present moment. Photo from 1990. Having begun to gain many profound experiences with the exercises he was being taught, Belsebuub started running groups and study centers in multiple cities in the UK and later in Australia, where he explained self-knowledge information and practices as well as other spiritual topics free of charge. His extensive practical exploration of spirituality over the last two decades put him at the forefront of personal spiritual research and meant he had become a leading expert in the field of self-discovery. He used this expertise to share the tools he was using in his own journey of inner transformation with others so that they could gain the same experiences he was having if they were interested. In 2001, after years of freely teaching spirituality and self-knowledge in study groups he had established across multiple continents, Belsebuub began to publish free online courses focused on three different subject areas, self-knowledge, out-of-body experiences and the journey to enlightenment. His course on self-knowledge, which has been known variously as the Searching Within course, the Self-Knowledge course, and the Self-Discovery course, became very popular, and was run both on and offline around the world. 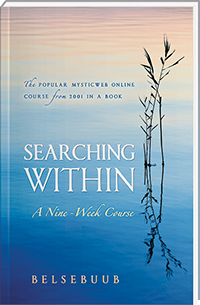 When first introduced, the Searching Within course was written and presented by Belsebuub as an eight week series of downloadable PDFs, with each weekly download containing information about a new self-knowledge topic, and a self-knowledge technique that allowed course participants to explore what they were learning in a practical way in their lives. This course was organized and presented through an online course system especially created for that purpose. This course system — which included course forums where participants could have their questions answered — was created at a time when the internet was still in relative infancy and e-learning was uncommon, and was therefore quite revolutionary in its approach. These different topics addressed various aspects of self-knowledge that could be explored by participants through reflection, observation in daily life, and through the practical exercises that accompanied each weekly download — all with the final aim of enabling course participants to understand themselves and their lives deeply and to live in a more fulfilling way. Due to the course’s popularity and success online, many requests were made for a face-to-face version of the Searching Within course. As a result of these requests Belsebuub also began running the Searching Within course in-person. The physical version of the course followed the same structure as the online course. Searching Within and its later variations went on to be run in eighteen cities around the world. Belsebuub’s self-knowledge methods as taught both online and in-person have proven to be very effective. They have been used by people from all ages, ethnicities and from all walks of life, with many people citing the powerful impact his self-knowledge work has had on their lives. ultimately gain inner peace and develop a more spiritual focus for their lives. Due to extensive plagiarism, the contents of Belsebuub’s Searching Within course stopped being delivered in the digital PDF format. Instead, the content of the course was revised and published as the paperback book The Peace of the Spirit Withinin 2006. The Peace of the Spirit Within was later revised and released as a free eBook titled Self-Knowledge for Spiritual Awakening in 2011. 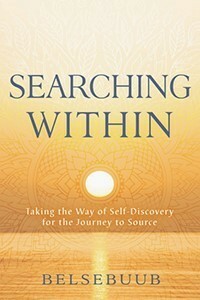 After again experiencing problems with plagiarism because of the vulnerabilities of a digital format, the eBook was withdrawn and instead released as a printed book titled Searching Within: Taking the Way of Self-Discovery for the Journey to Source in 2017. Belsebuub has never profited from the sale of any of his books, choosing to include a clause in his author contract stipulating that he not receive any royalties from their sale. The contents of the original PDFs from the 2001 Searching Within course have recently been made available as an eBook that can be viewed on the eBook page on this website. Belsebuub writes about self-knowledge and explains the work of spiritual awakening from his own experience and exploration of this subject over many years, and through his own spiritual journey. He expresses that the process is simple for anyone to undertake, but requires thoroughness, perseverance, and a dedicated approach, as well as a willingness to sincerely use the events of life as an opportunity for spiritual development. Belsebuub explains that consciousness can be developed by learning to place oneself in the present moment and by observing and understanding the various elements of the subconscious in order to eventually remove them. He states that when we are within egos we are unable to fully and objectively experience life in the present moment. The starting point to expanding our consciousness and experiencing it more fully, Belsebuub says, is the ability to be aware of our external environment, while simultaneously looking inwardly to understand the kinds of thoughts, emotions, and reactions that we experience as we go through our day. This process enables the consciousness to become active and perceptive, allowing an individual to learn more about themselves and to clearly see and interact appropriately with the world around them. Belsebuub explains that the subconscious states we experience are the cause and source of many problems, negativity, and unfavorable circumstances in our lives, which affect how we perceive both our internal world and the world around us, and dictate how we interact and react in the situations we are faced with in daily living. Belsebuub explains that by observing the different inner states, thoughts, and emotions within our mind and body, we can gain an understanding of them — not only of their source, but also of their outcome and impact upon our lives. By seeing and understanding these states, we can begin to gradually reduce them, which in turns allows the consciousness to grow stronger, and makes room for spiritual faculties and inner peace to develop within. In The Awakening of Perception Belsebuub stresses that “peace is a natural state of consciousness” whereas “thoughts, feelings, and emotions are passing and temporary”. He explains that finding peace within oneself can only be achieved through enabling the consciousness to be more active as inner peace is an innate quality of each person’s consciousness. Getting free of the subconscious and difficult inner states can be very liberating, Belsebuub explains, because these egos ultimately bring much suffering, inner conflict, and misery. In their absence the consciousness flourishes and we are able to experience the spiritual qualities that exist deep down within because they cease to be smothered by the egos. Belsebuub describes how living life through consciousness enables feelings of true love, empathy, care, and peace to emerge, which ultimately improves the quality of our lives and the lives of those around us. Being aware of the egos and staying grounded in consciousness helps us respond to life with more wisdom and intelligence. But beyond even this, Belsebuub explains that our consciousness — and through it perception of the present moment — can eventually allow us to reunite with divinity, and to fulfill our purpose as human beings through meaningful spiritual progress. The underpinning objective within all of Belsebuub’s works is to provide information about the opportunity all individuals have to undertake a process of true spiritual awakening. His work provides a practical roadmap that not only explains the process of transforming ordinary human consciousness and merging it with divinity, but that ultimately gives the tools to enable an individual to get free of nature’s process and to return to the source of all creation. Belsebuub explains that this process takes place in an ordinary life lived wisely, where the events of daily living are used as a source of self-knowledge and an opportunity for fundamental inner change. He explains that walking the spiritual path and reaching enlightenment is not simply the result of advanced meditation, awareness on its own, or some form of realization. Instead, he states that it is an internal work with self-knowledge at its core which is completed over a period of many years. This work also requires spiritual alchemy and the understanding and removal of the ego states in order to undertake a challenging, but ultimately very rewarding process. As well as accessing the Searching Within course as an eBook on this site, Belsebuub has created many resources including books, articles and videos that explain the most effective information and techniques an individual can use to experience self-knowledge, inner change and awareness. 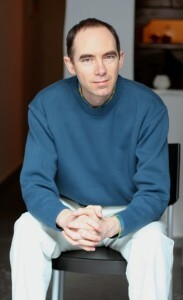 You can access some of his work on self-discovery, consciousness and personal development on his website Belsebuub.com.